It has been such a dramatic year of 2012 for Duncan Family but we both survived. I wish a blessed and healthier year of 2013 for all of you and us. 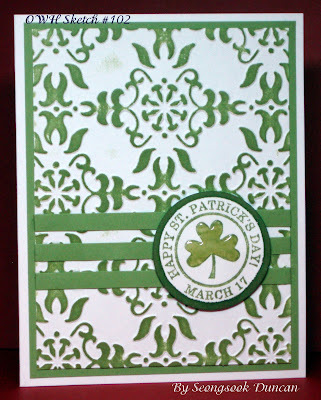 I had a bit of hard time, too, just to pick 10 cards among all those cards that have been made in 2012. I selected these cards that are made based on OWH sketches. Please click each OWH Sketch # that is linked to the original post at OWH Stars & Stamps blog. I hope you will enjoy. Wow Seongsook your cards are beautiful! I always enjoy visiting your blog and being inspired. 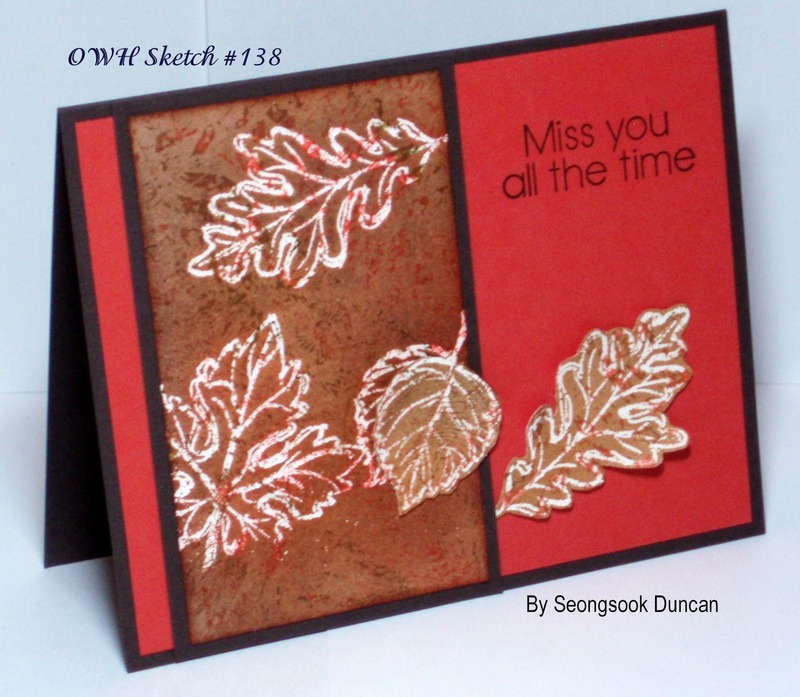 Seongsook, I always enjoy seeing your cards! You have such lovely creations. Happy New Year! Seongsook, your collection today is gorgeous! I just like your style. Happy New Year! Every card is amazing, but I think you saved the best for last! That patriotic beauty is fantastic! NJ on all, and happy new year! Wonderful! I do love that patriotic heart too. Great example of a strong focal point. Seongsook,as usual a stunning collection! Much to learn from here. Happy New Year Seongsook! 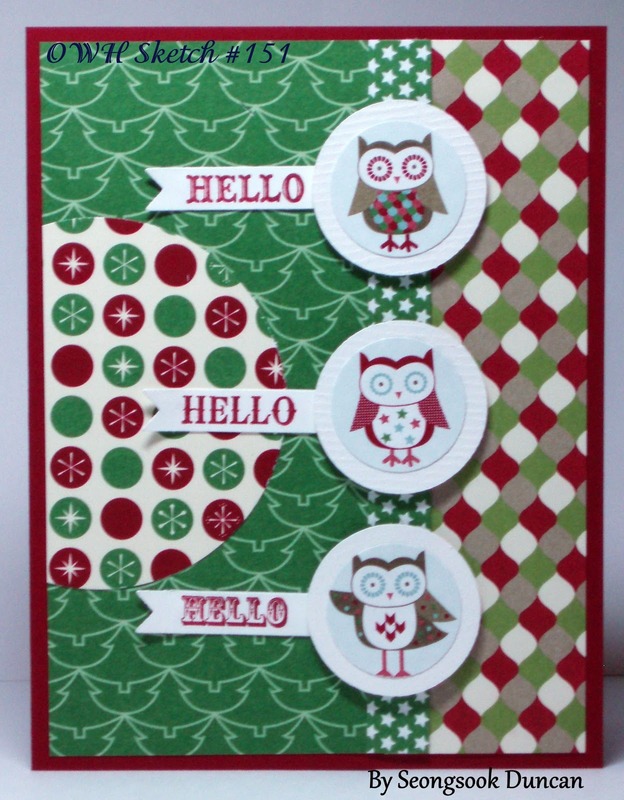 Your cards from last year are all gorgeous! Your sketch 90 is absolutely gorgeous! Your cards are always so beautiful -- true works of heart. 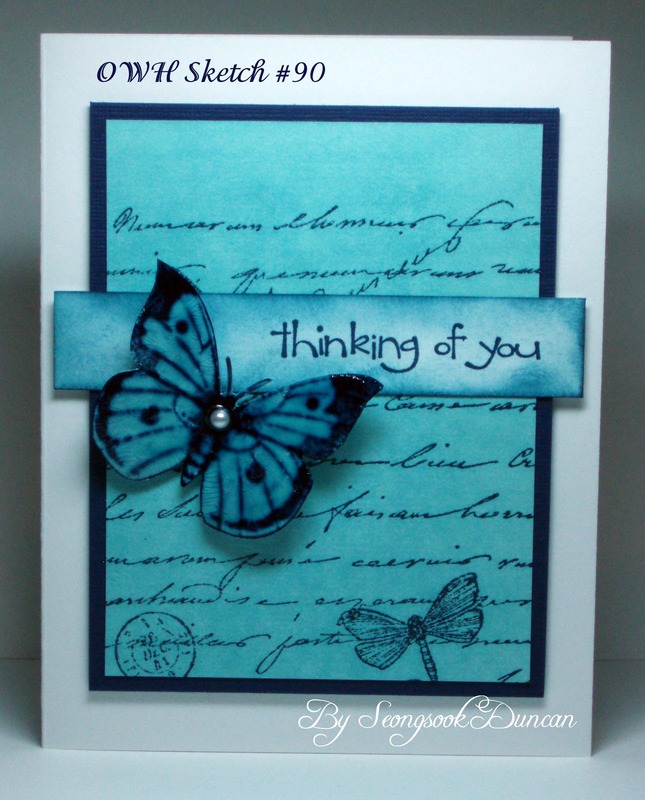 I love the blue-on-blue butterflies. The inking is perfect -- and the little pearl is the perfect finishing touch. 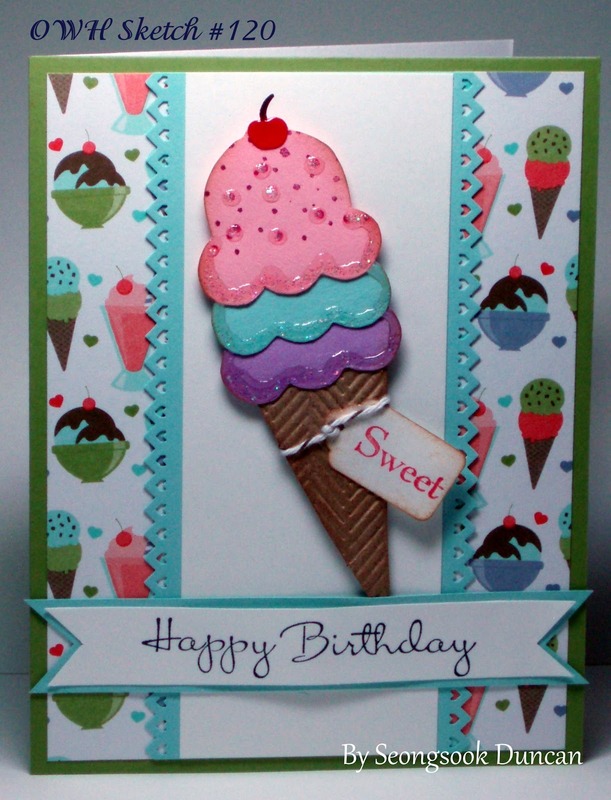 I'm also especially drawn to the paper-pieced ice cream cone. It's such a fun birthday card. Oh how to pick favorites!! Wow. Beautiful, every single one. I'm partial to the stamps in the last card though, the Stampers Best heart - and the patriotic colors! Just wonderful work, Seongsook!! Happy new year! Hi Seongsook, I couldn't wait to look at your 10 personal favorites! You are such a gifted cardmaker! The blue butterfly card is so gorgeous and your stunning patriotic card is a great way to finish your review of 2012! Wishing you a happy and healthy New Year! Your cards are beautiful! 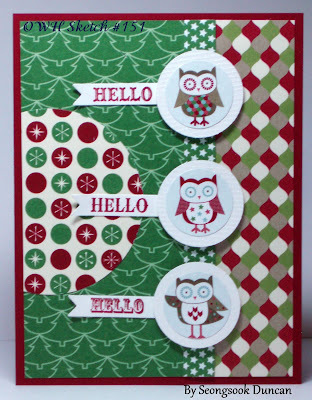 The blue butterfly card is my favorite but I love the whimsical owl card too! Happy and healthy new year wishes to you! 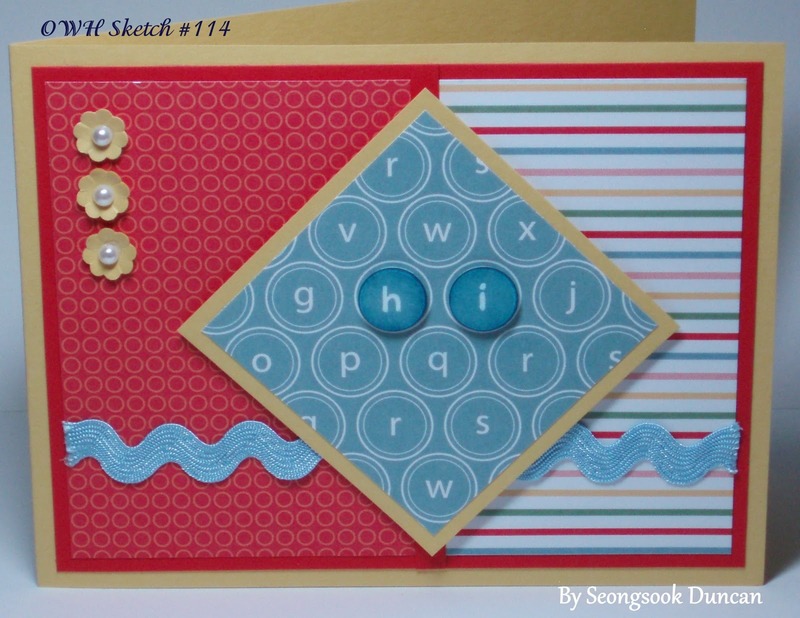 Seongsook, your cards are always so beautiful!! 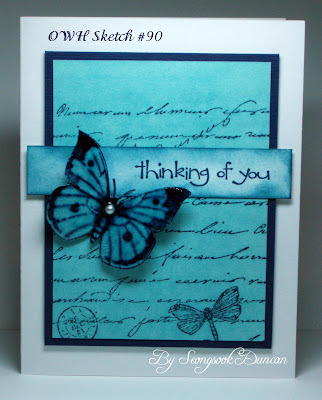 I love the the patriotic card and the blue butterfly card is absolutely gorgeous!! Happy New Year! Your cards are always beautiful! Thanks so much for being a great inspiration. I have admired your cards for quite a while now. These ten are especially great. I love the papers you use and the way you put everything together. Thanks for the inspiration! Great cards, as always! You do so much with the sketches! Thanks for sharing! Happy New Year! I always check your blog when I need some inspiration. Great selection for the year! Happy New Year! 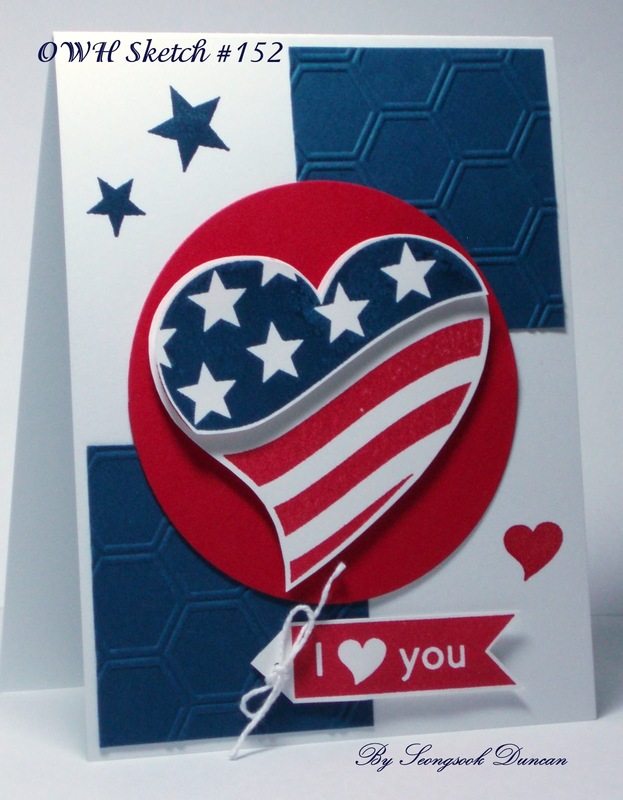 Great cards...I have to say that your two patriotic cards are stunning. Keep up the great work in 2013! tfs!!! Hi Seongsook! Your cards are all gorgeous. Love the details you always add to give such life to your designs. 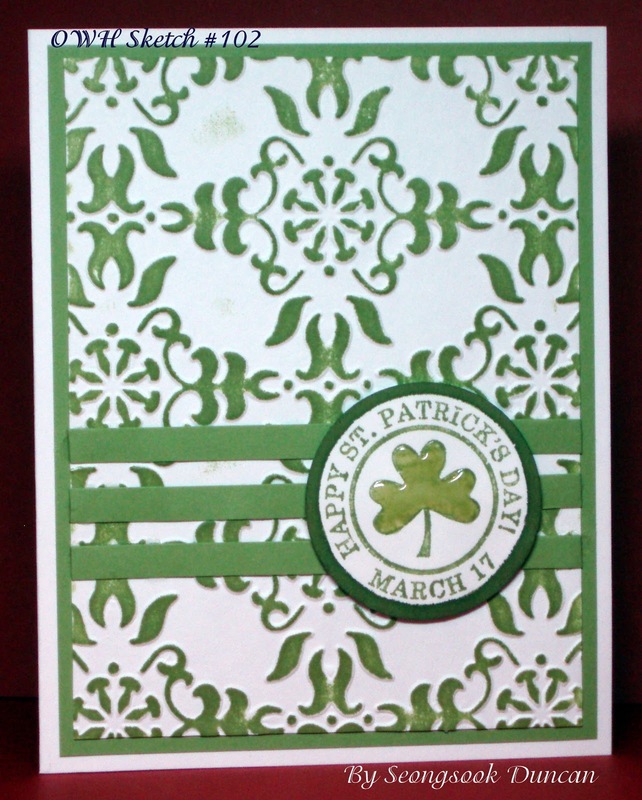 Your last card is wonderful - it has such great colors and a sense of movement. Love it! Happy New Year! Your cards are all gorgeous but my favorite are the first and the last. I love looking at you blog when I am looking for ideas. Happy New Year! It is always a treat to see your talents on display! Love the patriotic heart card - so many beautiful textures and colors. A beautiful selection of cards, Seongsook! Love the theme you chose, great way to promote the OWH sketches and inspire us at the same time. 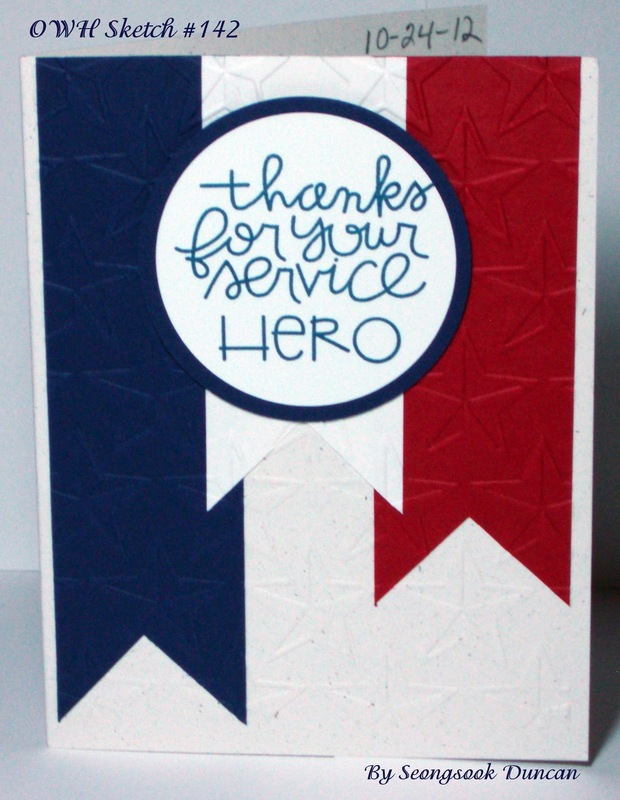 Your cards are always beautiful and I appreciate all you do for Operation Write Home. Oooo, love the first card so much! All of the cards are fantastic! All of your cards are wonderful, Seongsook. My favorite is the first one. 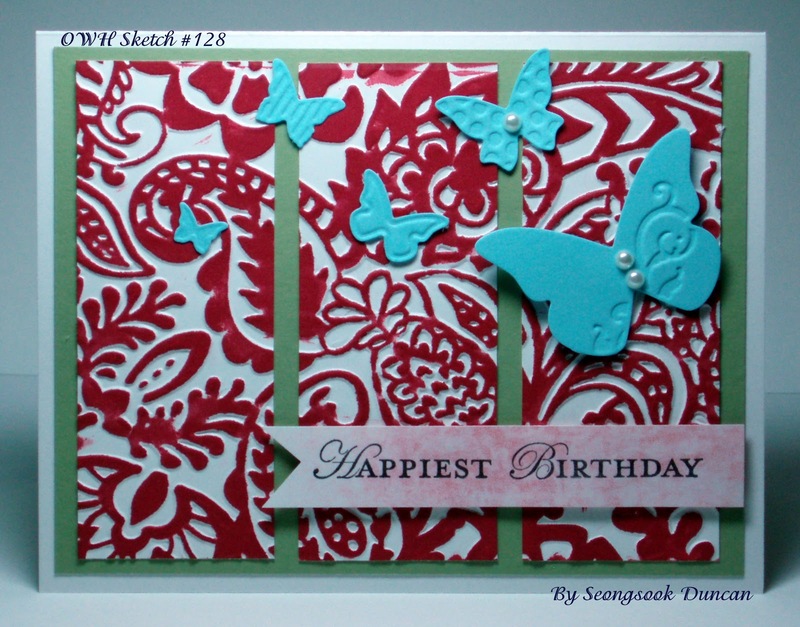 love your turquoise and red birthday card! so beautiful! 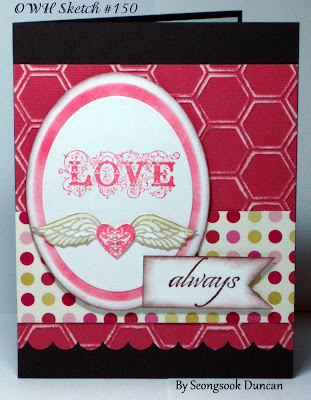 Your cards are always so beautiful and inspiring! I love the first two for their color and technique. And of course who wouldn't love the last one! Great job! happy New Year! I love them all! Thanks for sharing, friend! The last red white and blue one is spectacular! Wishing you a great new year... I hope that things are much better!! Big hugs to you! As I scrolled along, I thought there could not be any one favorite (because I really love them all), but then I got to the last card. THAT card jumps right out at you! Fantastic take on the sketch, love the popped up portion, use of the hexagon folder ... it's brilliant! TFS! !